We’re back with another of the Back-to-School series today talking all things lunch boxes. 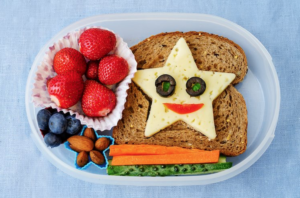 There is a plethora of options when it comes to school lunches and what to give your little one to take with them. As with the breakfast ideas, these can also be adapted to your own lunches, all contributing to your balanced diet. So, let’s get started! These include wholegrain, whole meal and brown options such as bread, wraps, pitta breads, pasta, rice etc. All of which contribute to your energy and as they’re slow-releasing, you avoid the sugar-high as with quick-release carbohydrates found in white or refined options. Next, your sandwich filling. Ideally a lean protein source is best, and the less processed, the better. Boiled chicken breasts, torn when cooled work perfectly for sandwich fillers, along with turkey breast and tuna. Processed meats such as packet ham are not recommended as frequently, due to the high salt level and preservatives, but for some picky-eaters who love ham, ham works too. For meatless options, a hard-boiled egg mixed with some light mayonnaise does the trick and is super tasty. Try adding one green leafy salad such as spinach, rocket, lettuce etc. Adding extra salads such as tomato, onion, cucumber, peppers is also a bonus. For lunch boxes, chopped fruit is a great snacking option. If the fruit tends to brown over time, drizzle some lemon over it to help prevent this. Cheese is also a good idea, and plenty of mini servings are available in string format, blocks and even shapes. Mini yogurts can also add to the calcium intake, but again just be aware of the sugar content in these. Hummus and veggie sticks. Chopped celery sticks/bell peppers/cucumber/carrot sticks all work well with hummus and are handy to take anywhere. Last night’s dinner leftovers can be a very handy lunchbox filler. A small serving of rice or pasta with some veg, meat and a tomato base sauce is great hot or cold. Cold stir fry or cous cous are also healthy options that can lighten your morning preparation of lunch boxes.